….How to look after vellum heads. …How to look after vellum heads. There is a general steady return to using natural skins on percussion instruments, and I am not surprised. There are many reasons for choosing natural over plastic, but sound quality has to be the primary objective. The depth of the timbre is far greater from vellum heads than is produced from their plastic counterparts, so the overall sound heard has so much more richness. There are however two “negatives” against choosing natural heads: cost and care. This post is primarily concerned with the care aspect. The best way to understand what to do with particular instruments is to have an understanding of what is actually going on with this skin stuff. One word that should be in every percussionists vocabulary is hygroscopic. It refers to a material that can absorbs and releases water, and I can’t think of any carbon based material to which it doesn’t apply, including us. If the weather is cold and dry, our own skin suffers, becoming dry and tight, prone to chapping. Whereas if we stay in the bath too long our skin becomes soft and wrinkly, and feels loose. So logically although their skin is slightly different, this also applies to cows, and goats, etc. We utilise this property to our own advantage when we put drum heads on. Skin is made up of squamous cells which have different shapes so therefore they expand and contract differently. For us we can just think of a cow – the skin doesn’t need to stretch along the spine, because the cow is full size, but it does need to stretch around the belly, this means that the orientation of the drum head could be important dependent on the drum. However younger animals still retain elasticity along the spine, so those skins will respond more uniformly. The first essential requirement is drum shell preparation. The proteins in skin make very strong glue, and these are made sticky with water. So the drum head must be prevented from adhering to the bearing edge. I use lard on metal surfaces – lard is refined cow fat, so it marries up with the head used perfectly on a cellular level. On wooden drums I need something that sits on the surface of the wood, as opposed to soaking into the fibres which is what lard would do, so I use tallow, which is boiled sheep in candle form. Both lubricants are placing a slippery barrier between the skin and the drum which stops it from sticking, but also allows the head to move. By wetting the playing surface before the head is put on the drum, the skin will mould itself to the profile of the bearing edge and create a good contact. If this is not done, then the head may buzz in the areas where there is a fraction of a millimeter gap. Additionally, it can be easily stretched, so that when it is put on the drum, I can pull the skin down the sides of the drum and create a collar if required. 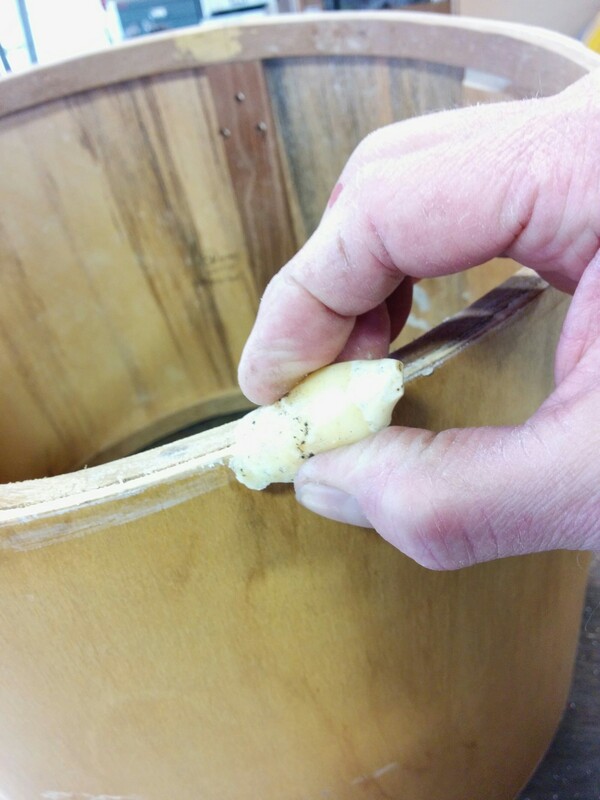 Now the skin is on the drum, as it dries it shrinks and becomes tight, and the pitch rises. Here is the key thing to remember. On a snare drum or timpani, achieving a high pitch is always the challenge when tuning with vellum, so give yourself every assistance – after playing take all the tension off the drums, so that as the head moves with moisture content, it is not being stretched, it is being encouraged to shrink. However Bass drums, have the opposite problem, they need to have a low pitch. Additionally the head is massive, and the skin is thick (or should be – Adams use exactly the wrong type of head on their drums) so the power in that skin is massive, and it always wants to shrink. Therefore, before that drum goes away, crank it right up and retain that collar. I know it’s a hassle, there are loads of tension bolts, but the quantity is needed to restrain the head, and is why they should be T handles. The bottom line is that if you want to enjoy the sound of real skin be prepared to spend time tuning up before playing, and looking after your instruments when you are not. Loving the blog. Have you looked at Storie yet? Awesome. I can’t wait to see them. After thinking about your question on and off whilst I have been working. I also have a question of my own in response: When you say, “I’m sick of it going floppy in damp weather,” do you mean whilst you are playing the drum? 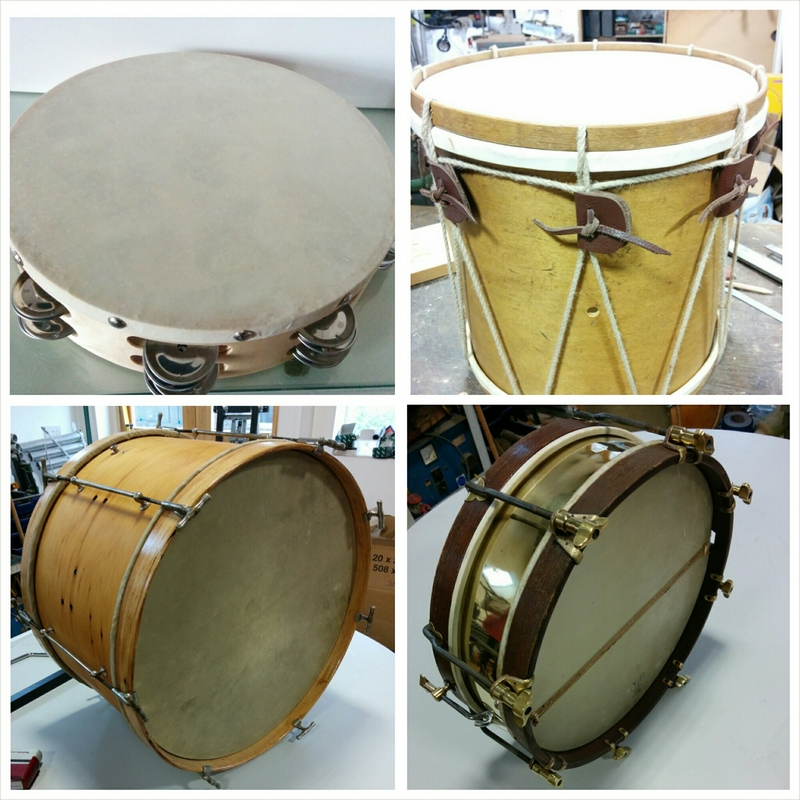 Or are you struggling to get the drum up to tension when it comes out of storage? Right at the top of the potential problems is the diameter of the drum. 14″ snare drum shells are probably around 13.1/4″ in diameter to fit inside a drum head with a 14″ external diameter. So before you start spending your money, make sure plastic heads will fit by physically trying it. Furthermore on old drums the shells are rarely round which is why I think you need to actually offer a head up to the shell as opposed to just measuring it (although measuring may well answer the question). Now to the heads themselves. Remo Fibreskyn in general are the heads I prefer on the batter side – I just think that the renaissance heads are better for timps and possibly orchestral snare drums. The last thing I want on a drum is a perfectly uniform head, whereas this is exactly what I do want on a timp to produce a specific pitch. The nature of the coating on the fibreskin will interrupt the vibrations and give a drier sounding drum. On the snare side I would be tempted to use the same especially if you have gut snare wires. I would go for the two thinnest heads if you want to experiment, or just get two of the same (thinnest) thickness. My feelings are that it will be difficult to get tension in the drum, which is why I would go thin. I have a drum clamp that I have made for re-heading drums so I can get the heads on tight (because they always drop in pitch) and so they are on evenly, it also means I am not exhausted after doing one drum. I know I have not given a definitive answer, but I hope that I have been of help. You will also have deduced why I asked my question. -1. Rock, roll and twist again? ....How to look after vellum heads. ...How to adjust Ludwig Timp pedal. ...How your timpani has gone from sounding good to bad.